Are Kids Plugged-in 24/7? Limit Screen Time with Cell Phone Parental Controls! Today, almost every parent is concerned about the excessive use of smartphones by their children. They connect to the wired world 24/7. 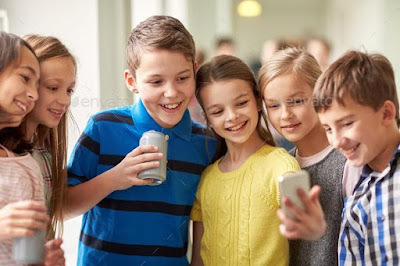 This round the clock web connectivity has become an obsession in today’s generation and it can harm their physical and mental development. Even if your kids are making a safe use of the internet and are not browsing harmful sites, then too, extensive screen times are medically dangerous. To reduce adverse impacts of this connectivity, try cell phone parental controls and limit their screen time. This infographic shows 50% probability that kids would experience pain in their finger/fingers after playing video games for hours. It explains how the kids who spend more time in front of the screen can have a problem in the blood vessels of their eyes, taking the discussion to the extensive use of social media can also cause media depression. All these factors can influence the focusing power of your kid that will lead to low concentration. Aren’t these facts alarming? Yes, for all of us, they are quite threatening. It’s better to monitor their devices somehow and keep a check over their screen times with a smart app. Screen addiction is increasing among teens and preteens today. To cope with the situation, parents are now provided with the parental tool that helps them set cell phone parental controls over their kids’ devices. For the purpose, they can make use of any advanced parental control app such as FamilyTime. Family Watch: Family Watch is a set of monitoring features of FamilyTime. With the Family Watch, Parents can keep an eye on their child’s call logs and contacts to see who they contact and when; while keeping track of the browsing history and the bookmarks list. Family Care: Family Care is all about the caring features that let parents view the list of installed apps on their child’s phone and help them identify the inappropriate ones. They can block any questionable app to make their kids avoid it. In addition to this, parents can add any suspicious number to Watchlist to get push notifications every time the contact is made by either party. Family Buzz: The Family buzz feature set lets parents receive panic alerts from their kids with their complete location in case of any danger or emergency. Family Locator: As the name suggests, the Family Locator set of FamilyTime enables efficient tracking system and allows parents to Geo-fence any address to get push-notifications every time they enter and exit that place. Family Link: The app lets families establish a strong link. It lets parents receive PickMeUp alerts from your children with complete location and help them stay on their toes to pick up the kids on time. Family Plus: The added advantage of this app is Family Plus. To limit screen time or disable the device in case of theft, parents can remotely lock child’s phone from their dashboard. By monitoring and managing your kids’ screen time, you can easily ensure a safe use of mobile phones. You can become a smart parent in this digital world by using apps like FamilyTime. It is economical but at the same time feature-packed, too. Try the app yourself and ease parenting.